jb Capacitors manufactures Box Type Metallized Polypropylene Film Capacitor for Capacitive Divider.Suitable for applications in serial with the 100~240Vac mains, as energy meter, a small power LED driver module, small household electrical appliances control panel (electric kettle, electric cooker, coffee machine, hair straightener etc. 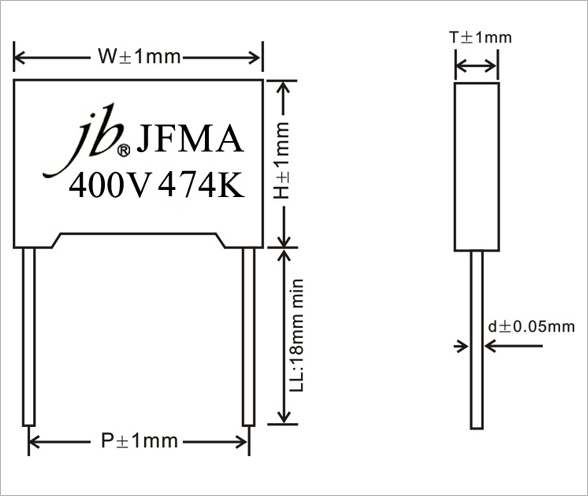 ), thermostat, replace the transformer.Widely used in LC resonant, high frequency high current situationFollowing are our Box Type Metallized Polypropylene Film Capacitor JFMA features, specifications and drawing. Metallized polypropylene film, non-inductive wound construction. Good self-healing properties, withstanding surge voltage stressing. Good properties in damp environment. Excellent active and passive flame resistant abilities. 160% of rated voltage for 60 sec.